You don't have to wait until March rolls around to enjoy McDonald's beloved Shamrock Shake. 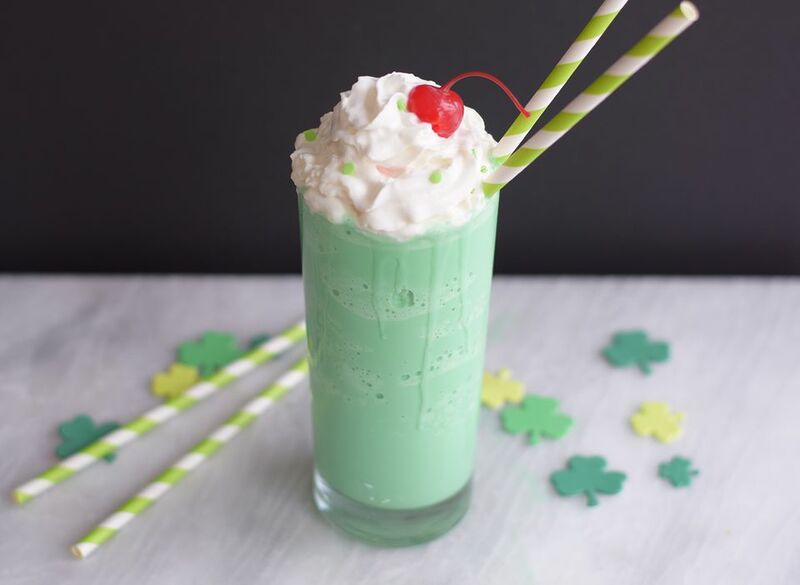 With only five ingredients, this minty milkshake is easy to throw together any time you're craving an indulgent treat. All that's needed is a little ice cream, milk, green food coloring, and mint extract. Give it a quick whirl in your blender, then top it all off with some whipped cream and a cherry. This is a simple and easy recipe to make with kids and it's a fun and delicious way to celebrate St. Patrick's Day as a family. Have your helpers measure and dump everything into the blender and then turn it on—with some supervision, of course. Have fun decorating the whipped cream topping with different sprinkles and do a little holiday crafting while you're at it. Make it as green as you like and start sipping! In a blender, combine the ice cream, milk, green food coloring, and peppermint extract. Blend until completely combined and thick. If it is too thick, add in a little more milk. Make it as thick and thin as you like it and add more food coloring if you want it to be greener. Top the milkshake with the whipped cream, cherry, and add a few sprinkles if you wish. Using a gel food coloring not only creates a nice rich hue, but you don't have to use as much as regular food coloring. You only need 2 to 3 drops of gel food coloring instead of closer to 10 if you use regular green food coloring. Use a natural peppermint extract for the best flavor. Make sure to use peppermint extract, not extracts labeled "mint." Those will have more of a spearmint flavor. Try out this natural Shamrock Shake if you're looking for a lower calorie and healthier option. It's made green by spinach—you won't taste the veggies in the shake, but your will reap its health benefits. Make this milkshake dairy-free with a alternatives like soy, almond, or coconut milk and a dairy-free ice cream. It won't be as creamy as the original, but it will still be delicious. You can also replace the ice cream with a mint ice cream. You won't need to add in any mint extract, but you will need to add in a little more green coloring to give it a vibrant hue.